It’s a bit of an important week this week, and for a reason largely absent from the market calculus of the past few months. Wednesday sees the Federal Reserve announce its policy decision; while no one expects any change in actual policy, the statement will be parsed even more closely than usual for signs that the policy winds may be shifting. That Big Ben essentially declared the recession to be over recently, in advance of the official data release, may simply have been an acknowledgement of the obvious- current quarter GDP will deliver a positive print when released towards the end of next month. Yet there may be some concerns that the Fed may start to guide the market’s gaze towards its exit strategy; having been excoriated in some circles for its “free money giveaway”, some Fed voters-particularly the regional presidents-may wish to signal that they do not intend to repeat Easy Al’s mistake of taking forever and a day to withdraw stimulus. The jitters caused by the “paid advisory report” last week suggest that the patient will not enjoy coming off the methadone. That equities have stumbled out of the gate so far this week does not suggest a willingness to look past a possible exit strategy, either. That having been said, it does seem as if markets are pricing at least some degree of risk premium as to the development of an exit strategy. 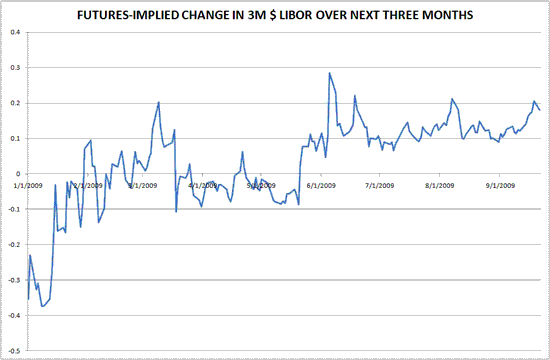 Using the front two eurodollar contracts, we can develop a “constant maturity” estimate of where 3 month LIBOR will be, say, three months into the future. 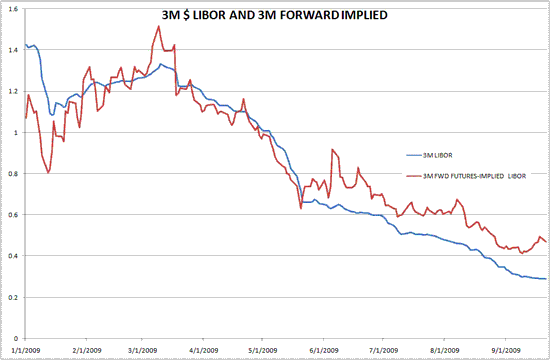 As the chart below indicates, markets have priced 3 month forward LIBOR higher than the spot fixing rate for the past several months after pricing it at or under the spot fixing for most of the first half of the year. If we look at the gap, it’s at the high end of the 2009 range; the peak just shy of 30 bps came on June 5, when “strong” payrolls were released and front ends went into free-fall. What does it all mean? Frankly, Macro Man isn’t positive. The rise in the forward-LIBOR risk premium suggests that the market is a touch nervous about what the Fed might come up with; as of Friday, this hadn’t meaningfully impacted either equities or the dollar, though today they have reversed recent price action. By the same token, the opening up of this little risk premium suggests that if the Fed delivers an unchanged message, a relief rally could ensue- particularly in the front eurdollar contract, where positioning is admittedly heavy but there’s a bit more “juice” than in the EUR or GBP equivalents. From Macro Man’s perch, it’s probably a bit early to be publicly discussing exit strategies- sure, markets have priced in a bit of reflation, but the SPX is still down 15% y/y and the dollar’s largely unched over the same horizon. From the Fed’s perspective, they are still at the point of adopting a “minimax” strategy- i.e., trying to minimize the losses in a worst-case scenario. If, after a quarter or two, private demand looks resilient (and bear in mind, Macro Man is highly sceptical on this count), then the Fed will feel comfortable. But to Macro Man’s mind, that’s a 2010 story, not a 4Q09 one. Of course, he could be wrong…in which case it could be a big week, but not in the way that he might like.